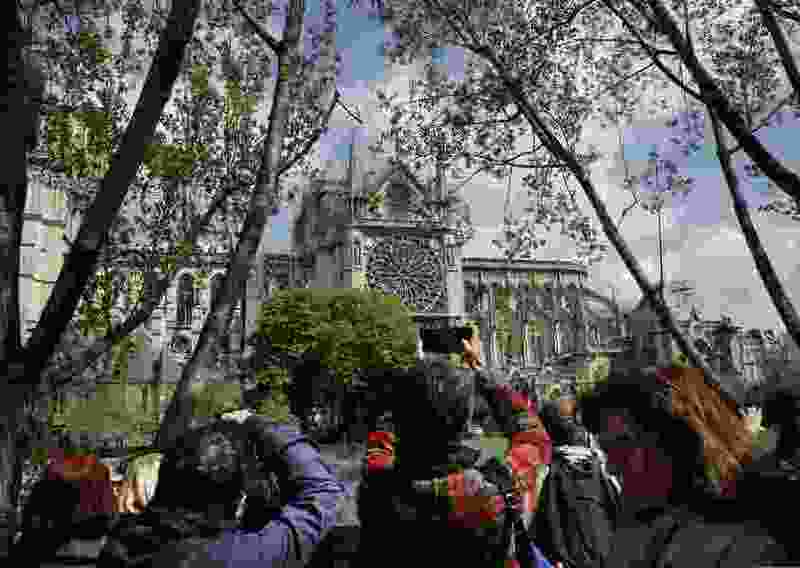 (Christophe Ena | The Associated Press) Tourists and others photograph the damage to the Notre Dame cathedral in Paris, Wednesday, April 17, 2019. Nearly $1 billion has already poured in from ordinary worshippers and high-powered magnates around the world to restore the Notre Dame cathedral in Paris after a massive fire. Paris • With its iconic cathedral scorched but still standing, France on Tuesday launched an investigation into what triggered the Notre Dame inferno and how a fire that had probably started by accident could gut the symbol of a nation. As the smoke cleared from the sky Tuesday, it was almost possible to look head-on at the church — to see its carved statues and two rectangular bell towers — and imagine that all was intact. Much of the valuable art and relics had been saved. Even the exquisite stained glass windows remained in place, seemingly immune to the previous day’s flames. But that belied the somber accounting of all that had been lost, and how the religious and architectural landmark at Paris’s center had been altered. The church’s trademark steeple, part of the Parisian skyline since the mid-1800s, had been swallowed in the flames. Char and smoke marks licked portions of the walls. And the roof — with its centuries-old wood — had been destroyed like tinder, leaving gaping holes that let sunlight shine into the cathedral Tuesday. Officials warned that Notre Dame may still have gravely dangerous vulnerabilities, especially in the soaring vault. But a few government officials ventured inside, and camera footage showed charred rubble in front of the still-intact pews. In an evening address to the nation, French President Emmanuel Macron described the firefighters as heroic and said he hoped the country would reconstruct Notre Dame within five years — a shorter timetable than that put forward by experts. "We now have to get things done," Macron said. "We will act, and we will succeed." He said the rebuilt cathedral would be "even more beautiful." From around the world, more than $700 million in private donations poured in for reconstruction, while Parisians and tourists lined the banks of the Seine, bearing witness from a distance after police closed bridges that give access to the site. France's interior minister said more than 500 firefighters had been mobilized Monday to help extinguish flames that had filled the sky with smoke. But questions remained about whether any warning signs had been missed. Paris Prosecutor Rémy Heitz laid out a timeline in which an alarm went off at 6:20 p.m., but no evidence of fire was found. Only when a second alarm went off — 23 minutes later — was fire detected. "In the meantime, the church was evacuated because a Mass just started a bit earlier," Heitz said. A spokesman for the Paris prosecutor's office later clarified that it was church staffers, not firefighters, who looked into the initial alarm. Patrick Chauvet, the Notre Dame rector, told French radio that the cathedral's "fire watchers" were on constant lookout and three times each day made "assessments" in the vulnerable area under the wooden roof. "In terms of security, I doubt we could have done more," Chauvet said. Buildings such as Notre Dame — full of hidden nooks and passages, and composed of ancient timber and other old materials — are seen by fire prevention experts as particularly risky, especially when they are under renovation. Stewart Kidd, a consultant on heritage buildings in Britain, said that in old structures, by the time flames become visible, "they may have been burning for an hour" in unseen spaces. And when there is construction, Kidd said, "the building is exposed to all sorts of dangerous activity." French officials said they do not suspect foul play. Heitz said there were no indications that the blaze was started deliberately. Investigators plan to interview people from the five companies that were doing renovation work at the site. Before the fire, part of the Gothic structure had been encased in scaffolding. The Notre Dame cathedral was built over centuries, starting in 1163. It was partially consumed in just hours Monday, as thousands of Parisians and tourists stood sentinel, some singing "Ave Maria" and weeping at the sight. "Parisians lose their lady," read one French headline. In Strasbourg, the city's great cathedral, also named Notre Dame, tolled its bell for 15 minutes Tuesday morning in solidarity. There were no deaths in the Paris fire, but two police officers and one firefighter were injured, officials said. Culture Minister Franck Riester said on French radio early Tuesday that much of the cathedral's art and artifacts had been saved. The 8,000-pipe grand organ survived the flames — though whether it had suffered water damage was still to be determined. Riester also confirmed that firefighters had rescued the church's two most hallowed relics: the crown of thorns said to have been worn by Jesus and a tunic of Saint Louis, a 13th-century French king. The objects would be transferred from Paris City Hall to the Louvre Museum, Riester said. "It was necessary to bring them out through the smoke," Paris Fire Commander Jean-Claude Gallet told BFMTV. He said firefighters rushed into the chamber of the cathedral at the height of the fire to make the rescue. The cathedral's stained-glass rose windows, an ensemble that dates to the 12th and 13th centuries, are also most likely intact, said André Finot, a cathedral spokesman. "It's a bit of a miracle. We're very relieved," he told BFMTV. Vittorio Sgarbi, a Rome-based art historian, said that Notre Dame, even before the fire, had been an architectural mishmash — some parts original, but many parts added or replaced. "This is going to be a fateful event in the story of a non-authentic building, a sort of laboratory," Sgarbi said. Even as the fire still burned, France was making plans to rebuild the church. Experts predicted that reconstruction could take a decade or longer — in contrast to Macron's goal of five years. The effort was supported by Pope Francis, who on Tuesday called the fire a "catastrophe" and described on Twitter a desire that the damage be "transformed into hope with reconstruction." Many philanthropists needed little prompting. French luxury magnate François-Henri Pinault declared that his family would dedicate about $113 million to the effort. The family of Bernard Arnault, chief executive of the LVMH conglomerate and the richest man in Europe, pledged $226 million. The Bettencourt Meyers family behind L'Oreal matched that offer. Companies including Apple and the French oil giant Total also made pledges. "I am not religious myself; I'm an atheist," said Charles Gosse, 23, a business school student who launched an online funding campaign and quickly raised $27,000. "But this is beyond religion. It is a national monument like the Eiffel Tower and the Arc de Triomphe." In their account of the fire and the rescue effort, firefighters told local media that after the first call came in, they had to get through rush-hour traffic clogging streets along the banks of the Seine. The flames quickly spread from the top level of the nave, eating up one beam, then another, in a portion of the roof called "the forest" because each massive support was shaped from an entire tree. The 750-ton spire, which was originally constructed in the 13th century and rebuilt in the 19th out of oak covered with lead, toppled shortly before 8 p.m.
At the height of the battle against the blaze, which raged for about nine hours, firefighters trained 18 hoses on the church, according to local media accounts. They pumped water straight from the Seine, the grand river that traverses Paris and flows near Notre Dame. A number of the people who came to see the building on Tuesday said their faith prompted them to come. France, though officially secular, remains predominantly Catholic, and even many nonbelievers are still baptized and married in churches. "I've been a Parisian for 62 years," said city native Alix Constant, a medical secretary. "When I saw the images of the fire, I had the need to see it with my own eyes. And even more so because I'm a practicing Catholic." Longtime Paris residents said they had a hard time comprehending the destruction. "I'm a believer," said Carine Mazzoni, 48, a lawyer who said her son was confirmed at Notre Dame. "It's Easter week. It's a symbol of Paris and a Catholic symbol. It's the history of the world that's united in this building." Birnbaum reported from Brussels. The Washington Post’s Griff Witte and Quentin Ariès in Paris and Stefano Pitrelli in Rome contributed to this report.